Our world is always changing - or at least the shop is. To keep our customers and suppliers up to date with what is going on at Access, we will publish news releases regarding what is new here. Be sure to check back now and again to see what we are up to. Exciting - more new machines! Here we are again turning the corner to winter. The snow started falling this morning and it seemed like a good time to post an update. We are rolling along here at Access Precision, having enjoyed a beautiful fall with warmer weather than usual. We moved into our new production facility a number of months back and have been busy getting everything setup just how we want it. Access Precision Machining Ltd has adopted a policy with regard to Conflict Minerals. These are materials sourced from the Democratic Republic of Congo ( DRC) and include the following: Tantalite, Tantalum, Tin, Gold and Tungsten. Access Precision is committed to avoiding the use of Conflict Minerals - see the Policy Statement below for further details. 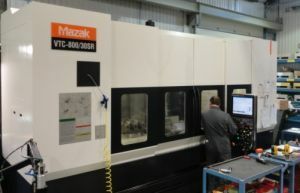 Access Precision Machining has taken delivery of our new Mazak VTC-800/30SR machining centre. Machine specs as follows: X = 118.0”, Y = 31.5”, Z = 30”, B = 110deg +/-C 48 tool capacity 18000 RPM 47 Hp Simultaneous 5 axis control The VTC-800/30SR machining centre boasts a long bed and a unique swivel head which increases the multipurpose nature of the machine and allows for the machining of complex features and contours. Welcome to the new web site! Access Precision Machining has undertaken a website re-development project with the goal being to keep our customers and suppliers up to date with what we are doing. Take a look at the site and let us know your thoughts.